All of Aracari’s expert travel planners are based in Peru and have traveled across these regions in different weather conditions. 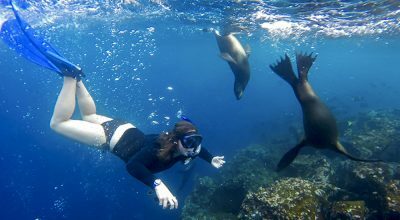 They are best placed to share honest advice and design your tailormade trip to make the most of your travel, whatever the weather in Peru at the time you choose to visit. The peak of the rainy season but a great time to visit due to the lack of tourists. In Ollantaytambo, in the Cusco area, there are colourful processions marking the “Bajada de Reyes” or Epiphany on January 5th and 6th. The day is celebrated with a procession and native dances in costume. On the coast it is warm and generally sunny so a very nice time to be in Lima and along the coastal desert. Candelaria is a colorful dance festival celebrates the patron saint, the Virgin of Candelaria, of Puno, on the shores of Lake Titicaca. It is one of the largest festivals in Peru each year. Hundreds of dance groups from all over the Peruvian and Bolivian Altiplano converge in the city of Puno for the processions to the Candelaria (or Candlemas) Madonna, and there is an enormous, all day dance competition in the stadium. For photographers it is an absolute must. Throughout Peru, Carnival week is widely celebrated preceding the catholic season of Lent. There are parades and parties in the streets and one of the traditions involves water fights. Visitors during this time are forewarned that they may be soaked if caught in the midst of street parties and the crowds can be chaotic. Weather wise, March and also April mark the end of the rainy season and even if there are a still a few showers and clouds, it is a magical time to be in the Andes, when the landscape is green and lush, wildflowers are starting to blossom and the harvest season starts. On the coast it is sunny and warm. The rainforest by cruise is perfect, on a lodge is doable but sightings can be scarce. And it is not peak tourist season. Arguably the best overall time of year to visit Peru. Easter sometimes falls in March and sometimes in April. The season for religious celebrations kicks off at the beginning of Easter week on Palm Sunday. Below a short synopsis of the most important processions and celebrations during Easter Week. Palm Sunday features processions in all villages and towns of Peru with decorated floats, leading up to Easter Sunday. In Ayacucho the festivities are especially elaborate. Señor de los Temblores (Lord of Earthquakes) is a major festival where Cusco’s most venerated image of Christ is taken out in procession in the afternoon on Holy Monday. The entire city participates making it quite a spectacle to behold. May is an excellent month to travel in Peru. Ideal for trekking as the visibility will be at its best and night time temperature not very low. 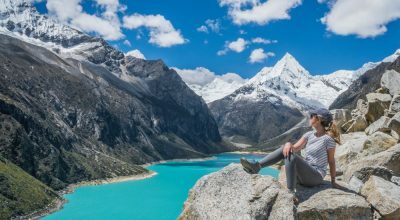 Trekking in the Cordillera Blanca, where the highlights are the Glaciers and Snow-capped peaks, is ideal. Throughout Peru and especially in small villages and rural areas, the “Cruz de Mayo”, the festivity of the Cross at the beginning of May is widely celebrated is a colorful celebration where decorated crosses are carried during processions. There are processions from the first of May until a few days later on a day called “Central” day. The Catholic Celebration of Pentecost is celebrated with four days of non-stop ethnic dances in Ollantaytambo in honor of their patron saint, Señor de Choquekillka. Nights are getting chilly in the Andes now, and clouds are starting to disappear. On the coast there is a dense fog that covers the lovely sunshine of preceding months and temperatures are decidedly lower. The highlight this month and the absolute showstopper is Corpus Christi in the City of Cusco. The exact date is varies every year depending on when Easter falls, but it is generally in June. Corpus Christi is Cusco’s most important religious festivity and is celebrated with fervor. A total of fourteen saints and Madonnas from each of Cusco’s churches participate in this colorful procession. Members of each brotherhood (cofradia) prepare for a full year for the procession and money is raised to provide the most sumptuous attire for the saint or Madonna of their devotion. The result is a spectacular parade of bejeweled and bedecked statues, making their way from their “home” church to the Cathedral on litters carried by devotees. All of the saints and Madonnas are left on display overnight in the Cathedral and for a few days after Corpus and the doors to the temple remain open to all who want to come in and admire this magnificent sight. Inti Raymi, also in Cusco celebrates the Winter Solstice. Inti Raymi is a reenactment of what contemporary scholars have interpreted must have been the Festival of the Sun in Inca times. It now takes place in the Inca site of Sacsayhuaman near Cusco. It stopped being performed in the eighteenth century and was re-established in the 1940’s. The festival as it is celebrated now is a bit of a contrived experience in our view, but it is popular among visitors. July and August are the peak of the tourist season so it will be very busy. At Aracari however we are there to assist you navigating the sights in creative ways so you can dodge the crowds! On 16th July is the festivity of Virgen del Carmen or “Mamacha Carmen”, as she is commonly known. She defeats the demons who climb up on rooftops and balconies during her procession around the streets of Paucartambo. near Cusco, as well as other towns such as Pisac. Non-stop masked dancing carries on for three full days. Crowded with locals and limeños alike, the festivity of the Virgen del Carmen can involve some heavy drinking and partying in Paucartambo, but it is an enjoyable experience and worth a stop, especially in Pisac where visitors can see a milder but equally colorful version of the Paucartambo processions and festivities. The 28th and 29th mark Peru´s independence holidays (“Fiestas Patrias”) and this is probably the busiest week of the year for domestic tourism. This is the coldest and driest month of the year. The end of the dry season is the best time for sighting wildlife in the rainforest as animals are more likely to go out of their hiding places to look for food. Mid -August markes the “Virgen de la Asuncion”, a Madonna widely venerated in Peru. Processions take place in parishes dedicated to her. There are processions in Cusco, in Chivay in the Colca Valley among others. In Lima, Fiesta de Santa Rosa de Lima on August 30 is a religious holiday with processions, parades, and brass music. Most businesses are closed for the day. Virgen De La Almudena Y De Las Nieves on September 8th is one of Cusco’s most venerated and “richest” Madonnas, hence the importance of her procession. On the same day in the Sacred Valley, many villages such as Maras (Church of Tiobamba), Huayllabamba and Chinchero have the feast day of their Madonna. Señor De Huanca in Cusco on September 14th is one of the Andes’ most venerated Christ figures and the pilgrimage involves people coming from far and wide. San Jeronimo is celebrated around this church in the vicinity of Cusco on September 30, with dances and processions. Mistura is the most important food festival in Latin America. Taking place in Lima, vendors from all over the country come to share their food at the festival which includes cooking demonstrations, dances, and more. Señor de los Milagros (Lord of the Miracles)is venerated with fervor in all of Peru but especially in Lima where he is the patron. His colour is purple. To celebrate him, there are processions where a float with a painting of his image is brought out in procession along the streets. Lots of purple decorations adorn the city, and street vendors are characteristic of the celebrations. Try the “turron de doña Pepa,” a typical sweet prepared and this time of year. Expect traffic. The Hay Literary Festival is an illuminative gathering of thinkers from around the world. The sister festival in Arequipa, Peru gathers some of the intellectual minds of South America for lectures, readings, and workshops, that span 4 or 5 days every year. Fiesta de la Inmaculada Concepción (Immaculate Conception) is a national religious holiday in Peru. There are processions in many churches where this Madonna is the Patron. Processions in Cusco are lovely. Santuranticuy, the crafts market in Cusco´s main square, takes place on the 24th of December. The Plaza comes alive on the morning of Christmas Eve with artisans selling images for their nativity scenes. Well worth visiting if travelling in the area during this time of year. Peru is home to dramatic geographical diversity, with jungles, deserts, Andean Valleys and some of the world´s highest mountains, and this gives way to 30 of the world’s 32 climates. For that reason, the weather in Peru varies significantly from region to region at any given time of year. Because we are in the tropics, temperatures don´t vary much as there are no “seasons”. The wider fluctuations occur between daytime and night time temperatures. In a nutshell, the rainy season is between November and March with slightly higher temperatures, and the dry season is from April to October with lower temperatures. The dry season is considered the best time to travel weather wise, with a wider range of activities possible. But Peru is a year-round destination and that is the most important thing to remember. Weather wise, there are only two or three destinations that are highly seasonal: the Cordillera Blanca Mountains and the Southeastern Rainforest where we recommend travel only from April to October. Likewise, for trekking and hiking, especially where camping is involved, and for lodge based stays in the Rainforest, we would recommend avoiding January and February. For all other destinations, the weather is fine for travel year round. The rainy season in the Andes is not acute and intense as the monsoon season in Asia and visiting is perfectly feasible. Peru’s dramatic geographic contrasts, rich history and diverse ethnic makeup, results in a colorful array of festivals, especially in the Andes and Cusco region where Catholic traditions and pre-Hispanic customs combine to produce unique cultural events so there are plenty of events to plan your trip around, or to coincide with while you are travelling. Processions, large and small often follow the same pattern, with dancers in costume and images of Saints, Madonnas and Christ carried in floats around the town. The two main processions of this type which merit plannina a trip around them are Señor de los Temblores (Holy Monday) and Corpus Christi (May or June). The best time to visit Peru depends largely on where you plan to spend your trip. There are marked variations in weather between the principle three geographical regions in Peru- the Coastal Desert, the Andes Mountains and Highlands, and the Amazon Rainforest. For Machu Picchu, the main weather consideration is the difference between dry season and rainy season. This key region encompasses the weather in mountain and highlands destinations including Cusco, Machu Picchu, Lake Titicaca, Arequipa & Colca, the Cordillera Blanca, Cajamarca, Ayacucho and Chachapoyas. The key weather consideration here is the difference between dry season and rainy season, while taking into account there are shoulder months between these when weather is variable. Within the region, temperature and conditions vary based on altitude (higher elevation is generally colder and lower elevation warmer). During dry season it is generally sunny and there is little chance of rain, though it is not unheard of for there to be occasional showers. Temperatures are cooler in the dry season, though the variation between day and night means it’s best to bring layers! During rainy season, the highest chance of rain is usually in late January and February. While other months see rain, there are also often sunny and dry spells – though the timing of these is hard to predict! The Inca trail to Machu Picchu is closed for the month of February for maintenance work. Temperatures in rainy season are warmer than in the dry season. 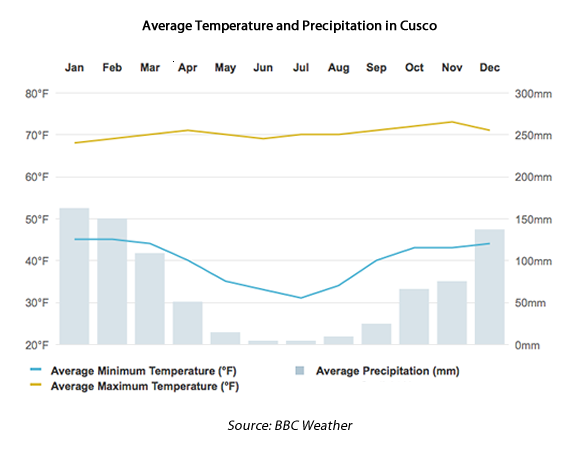 Example average temperatures and precipitation in the mountain city of Cusco can be seen to the right. During shoulder months between dry and rainy season, weather can go either way. With luck you will have sun and no showers, but if you travel in a year of heavy precipitation, you may find the same rainfall as December – March. 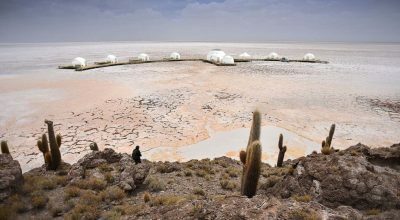 Because Peru has an extensive number of micro-climates, it is important to note that temperature and conditions will also vary within the region. For example, while Arequipa and the Colca Canyon are often visited together, the Colca Canyon and Valley are affected much more by the rainy season. Though technically in the mountains and highlands, Arequipa is generally temperate year round, while Colca experiences lower temperatures and heavier rains from December – March. Cities on Peru’s northern Moche Route such as Trujillo and Chiclayo, as well as the southern coastal cities of Ica and Nazca are hot, sunny and dry all year round. The northern beaches of Mancora boast consistent warm weather. Peru’s capital Lima is also on the coast, and along with nearby Paracas it can be cooler and overcast between May-October. Due to its desert geography, rainfall across the coast is minimal and rare. Destinations in the Peruvian rainforest, such as Manu National Park, the Tambopata National Reserve and the Pacaya Samiria National Reserve (visited via luxury amazon cruises from Iquitos) share the same dry and rainy seasons as the mountains and highlands. Though there are still opportunities for spotting wildlife during the rainy season from November to March, the opportunities are usually lower. Here we share information on when the best Peru festivals take place and travel advice on visiting them as part of any private, tailormade trip to Peru. Important and visually impressive festivals take place throughout the year in Peru. In particular, there are many local Peru festivals held in villages and towns across the country from March to September, marking the end of the rainy season whereby communities give offerings and say prayers for a good agricultural season ahead. Irrigation channels are cleaned and thanks are given to Patron Saints, to Jesus and the Madonna, or Pachamama (Mother Earth). 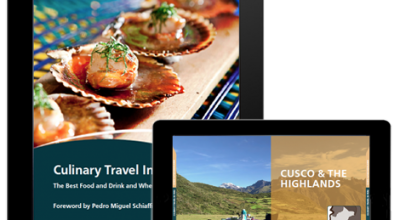 Visiting during these months will most likely coincide with some sort of celebration – our expert travel planners will advise you when designing your private, bespoke trip to Peru. Easter Week (Semana Santa) is one of Peru’s most important religious celebrations, with a week of reverent processions leading up to Easter Sunday. Our Peru festivals calendar is free to download and lists important Peru festivals and their dates. We have included the major Peru festivals that will appeal to visitors, as well as the most significant religious dates. Some of the religious dates may be celebrated with less colorful spectacle, but to see and understand the devotion with which they are celebrated is nonetheless a fascinating cultural experience. For centuries, dating as far back as 2000 B.C., Peru has been settled by developed societies with their own unique complex religions and administrations. Diverse ethnic groups lived scattered throughout the Andes, the jungles and the coast, organised in city-states, regional centres and even empires. The mixture with the Spanish and subsequent immigration from Africa, the Far East as well as Europe, has created a society that is immensely rich in culture, folklore and Peru festivals. Visiting Peru today, you can see how people celebrate the religious and natural cycles of their age-old calendars with striking fervour. Most religious celebrations and peru festivals have a pagan undertone: the shrines to the Virgin are often the same as those to the Mother Earth and those to Christ are often related to mountain worship, or Apus, as they are called. Furthermore, Peru boasts deep traditions of folk music and dance. There is Creole music on the coast, based on guitars. Andean music and dance is found in the mountains, with the world famous panpipes. There is also Afro-Peruvian music, which is a mixture of Latin American and African beats and instruments. Similarly, Bolivia festivals have a rich history dating back to before Christ. The neighboring country offers an additional selection of celebrations throughout the year that you can attend if you’re interested in seeing and participating in more of the region’s most significant festivals. Thanks to Peru’s wealth of history, expert guiding will make all the difference in understanding the historic and present-day significance of Peru’s festival culture, from seeing processions from the best vantage points, to understanding the symbolism in vibrant costumes and traditional music. Aracari connects clients with specialists in their field – such as anthropologists, who afford in-depth insight into Peruvian festivals and their traditions – as part of private tailormade trips to Peru.